Meet Dean, Shay, and Everly. This family are real food, clean living, low ‘tox, tree loving, gathering kind of folk that are on an adventure to discover ways to live sustainably, build community, and just downright have more fun. It’d be easy to place them in the category of weirdo-new-aged-hippies, but don’t be fooled, they’re really just your average Aussie family on an adventure to make sure their children (and maybe yours too) have some clean dirt to grow food in when they’re older, and ideally clean water and air to go with it. 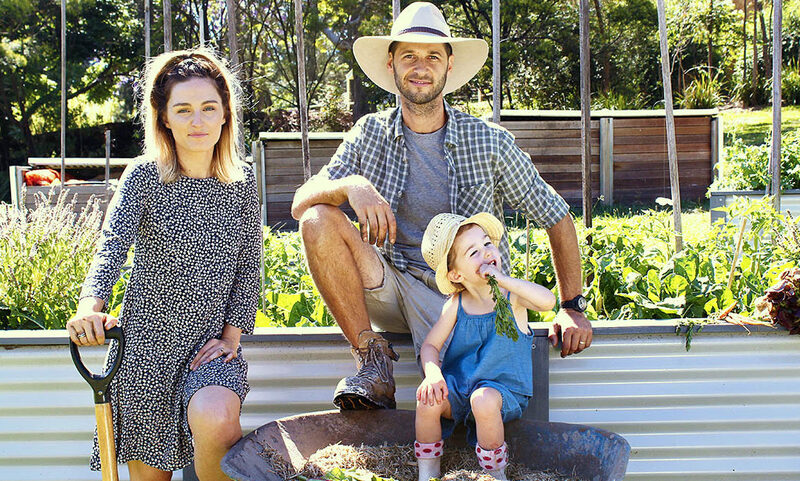 After winning Channel Nine’s The Block they made no secret of their desire to buy a farm and learn the ways of living slowly and enjoying more time as a family. Now – it’s time. This creative duo have sold their house, packed up anything that was left and put it in one of those places that store things for people when they’re busy using their other things. They are travelling with their little family around Australia where they’ll learn about the way others are living consciously (and loving it) while having fun exploring our incredible country. Because they think they’re pretty cool and love to see themselves on camera, The Gathering Folk are documenting their experience traveling as a family. They’re volunteering on farms, meeting urban veggie growers, working with communities, exploring sustainability and sharing meals with other families who are paving the way of a greener future. There is sure to be laughter, sweat, blisters and bumps in the road with the challenges of being rookies on the road to becoming farmers.